Saturday 25 August 2018. Photo: Douglas O’Connor. Papal vist, St. Patrick’s Hall, Dublin Castle. Taoiseach Leo Varadkar and Pope Francis. To a cacophony of church bells and helicopter blades, Pope Francis swept through Dublin city centre yesterday. The Argentine Prince of Rome greeted the ordinary people of this city with a broad smile and a Papal wave when, after completing his official duties with President Michael D Higgins, he travelled between two of the city's most historic landmarks: The ancient battlements of colonial rule, Dublin Castle, and the bastion of Catholic Ireland, the Pro-Cathedral, built with the pennies of the poor. What appeared to be a quiet welcome, as he arrived in Dublin Castle before 12.30pm, swelled to a real Dublin welcome by the time he left the Pro-Cathedral and was driven down O'Connell Street to cheering crowds standing five or six deep on the broad pathways of the capital's main thoroughfare. 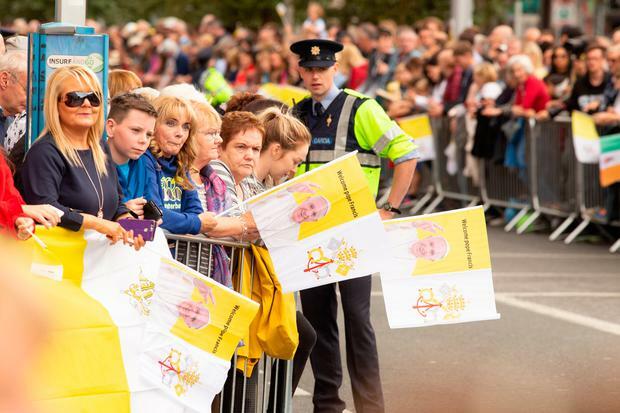 "It's not about numbers, it's about the quality rather than the quantity of the welcome," said Sarah Haywood who was dressed in yellow and waving a large Papal flag. She had travelled from Bristol in the UK to "grow my faith" at the World Meeting of Families. "We're lucky to get to see a second Pope," said Liam Murphy, originally from Kilkenny, waiting in O'Connell Street. His mother, a devout Catholic, died a year before the visit of Pope John Paul II, so it was a poignant moment as he waited patiently. "It's a different Ireland, but people are still turning out." There was a carnival atmosphere around the city centre. 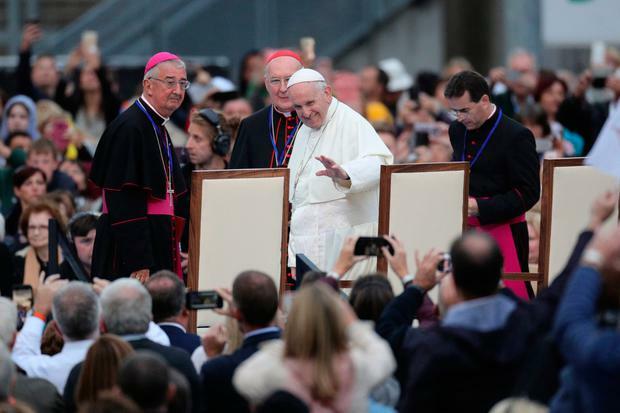 Devotees, tourists and onlookers lined the long route chosen through the city centre and, if the turnout seemed at first to confirm the fall-off in Catholic devotion, there was a surprisingly large crowd lining the Pope's route by late afternoon. A wax effigy of Pope Francis outside the Wax Museum in Westmoreland Street was popular with tourists and locals alike for photographs. And when he did eventually pass onto Marlborough Street en route to the Pro-Cathedral, a forest of phones was held aloft to capture the moment. Before 12.30pm, Pope Francis was escorted by cavalcade to Dublin Castle. Crowds had gathered around the entrance gates. He looked out of the back of a blue Mazda car, smiling and waving to the crowd who cheered. 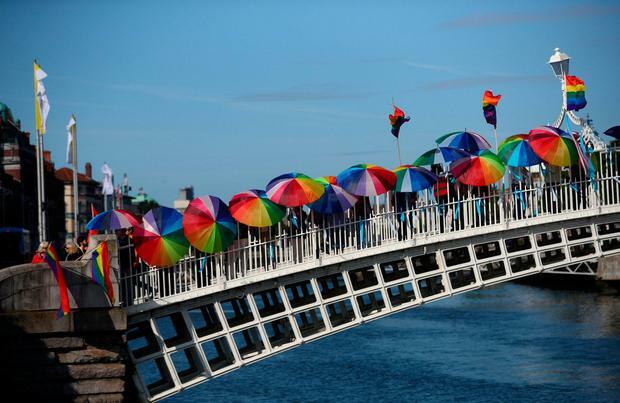 It was relatively low key, with much of the crowds composed of tourists and visitors who had come to Dublin for the World Meeting of Families. "It's a great day, a great atmosphere," said Mick Merideth who had travelled from Newbridge in Co Kildare and was spending the day around the city as he hadn't got tickets to any of the official events. "I saw the Pope in '79 in Maynooth and I wouldn't miss it." 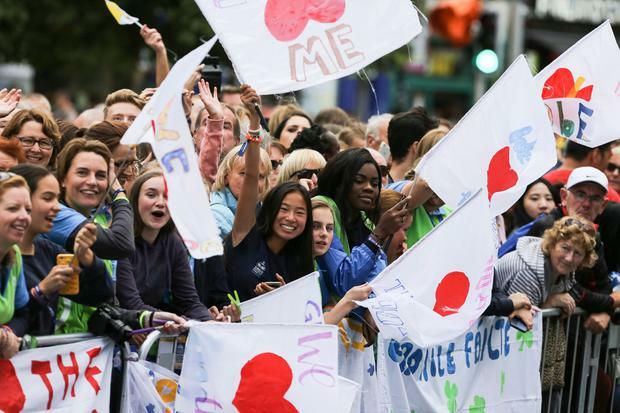 The streets of Dublin gave an Irish welcome to Pope Francis. Papal flags flew. Balloons in the Papal colours graced the front of Supermac’s in O’Connell Street and Papal flags were taped to the windows of the Carroll’s store. There was little fanfare. Some devotees were handing out Papal flags to anyone who wanted them, while the street sellers were trying to off-load their stocks at €4 a pop, "although they're worth €5," he assured us. Minister Mary Mitchell O'Connor stopped her car at the side entrance to Dublin Castle to take a photograph on her phone of some the crowd who had gathered in the bright morning sunshine. Helena Sheerin and Marie Heraughty were there from the Brosna Girls Clubs, which runs programmes for the less fortunate, teaching them basic things like cooking skills. "We've come out today, there are 60 of us, to say hello to the Pope, because of the honour he has given to us by coming to Ireland," they said. Standing outside City Hall as the Pontiff drove through the gates of Dublin's iconic building to meet the great and the good was a lone protester, holding aloft a placard that said 'The Pope is anti Catholic' on one side and 'Arrest the Pope' on the other. He made his protest and quietly left. Further down Dame Street was councillor Mannix Flynn, who was holding a Papal flag, upside down, and a protest headed 'Signal'. "I wouldn't go in, it was important for me to stay out. We don't need words and we don't need prayers, we need action by the church and State," he said. "This gentleman who has come from Rome needs to stand with his flock and re-align himself with the people." He cited the arrest of clergy in the United States and said the Garda needed to follow this example. Later in O'Connell Street a group of women on the Pope's route held posters against the barrier with ''Your church raped and sold our children'' written on it. But despite the minor dissent, the streets of Dublin gave an Irish welcome to Pope Francis. Papal flags flew. Balloons in the Papal colours graced the front of Supermac's in O'Connell Street and Papal flags were taped to the windows of the Carroll's store, but otherwise the city was trying to function normally. It was almost strange to see priests and nuns in clerical garb on the streets, where once they had been so plentiful, again. Sitting outside his home on Church Street, 81-year-old Jimmy Connors was enjoying the atmosphere of the Papal visit from early morning. "I never thought I would see the day that the Pope would come down here," said Jimmy, whose home backs on to Brother Kevin's Capuchin Centre. Unlike much of the rest of the capital, the small streets off Church Street were festooned with bunting for the visit. There was a noted symbolism that before he went to meet Brother Kevin, Pope Francis visited the Cathedral church of Dublin located just a stone's throw from where a bitter feud has convulsed the city and claimed so many lives in the last two years. The Pro-Cathedral was once the headquarters of a "Catholic state for a Catholic people" but while that may no longer hold true, it yesterday added another "significant moment in the political and religious history of Ireland" with the visit of the Pope. It was from this church that the founders of the State, Michael Collins and much later Eamon de Valera, were borne on their final journeys to Glasnevin cemetery. It is where statues by John Hogan and Thomas Farrell commemorate the princes of the Catholic Church who for so long dominated the philosophy of the new State. But Dublin has always been a city of contrasts and contradictions. And is now a city that has welcomed a Pope at a defining moment for the Catholic Church in Ireland.